Update: Another infielder is trying to force the Mets hand, as well. Guillorme now is hitting .355/ .474/ .548/ .1.022 in 31 at-bats this spring, he’s also driven in four runs and has hit one home run as well as three doubles and a triple. He’s shown that he can handle the infield without a hitch when it comes to his defense and can easily save the Mets $3M by not putting Adeiny Hechavarria on the Major League roster. 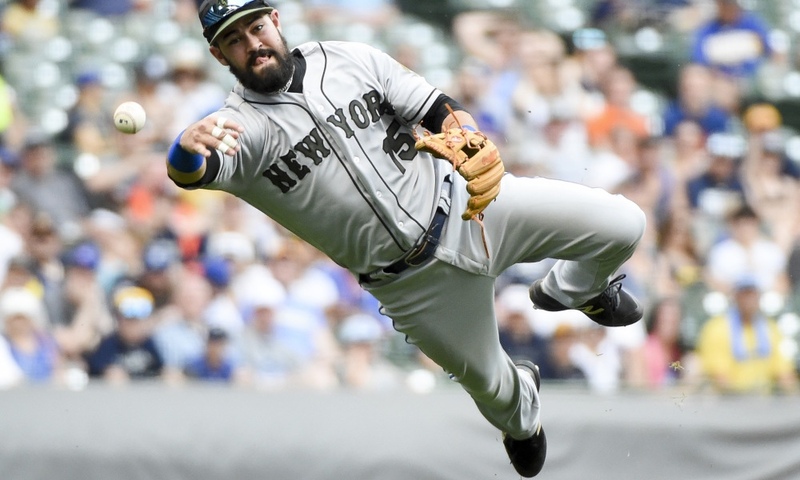 Luis Guillorme is a infielder that has always been known for his flashy glove up the middle but this spring, he’s continuing to show he can hit the ball, too. Guillorme took Ponce de Leon deep on a 2-1 fastball that made it over the right field wall, the home run tied the game against the Cardinals at 3 a piece. While he only has 8 AB’s this Spring, he’s accumulated 87 Spring Training AB’s throughout the last three Spring Training’s , batting .310/ .419/ .437/ .856 with two home runs, 14 runs driven in, and 16 base on balls. This spring, Guillorme is batting .500 in his 8 AB’s and is continuing his solid defensive effort. The Mets now have the ability to save some money if they decide to go with Guillorme over Hechavarria, who is slated to earn $3M if he makes the 25 man roster. The Mets may also have the option to carry Espinosa as well as Guillorme, depending on some of injuries that have been plaguing the infield.